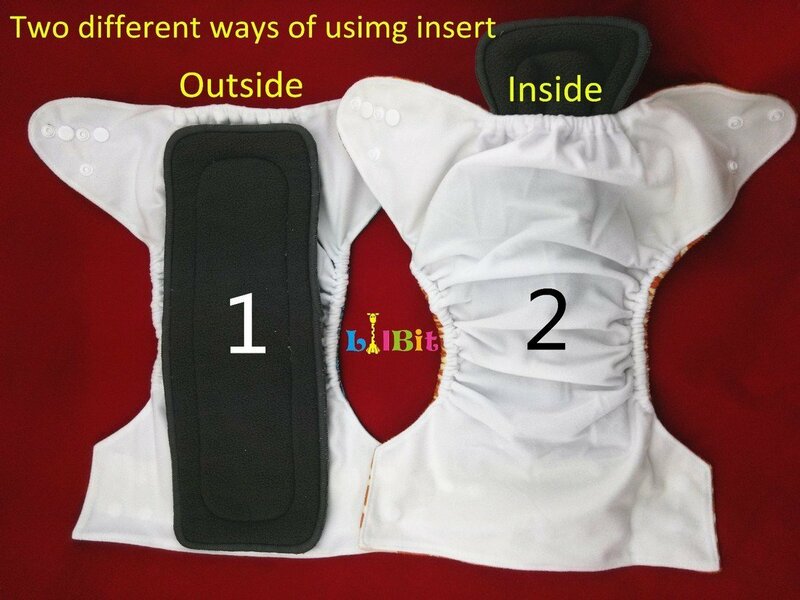 LilBit cloth diapers contain comfortable material and fine workmanship. They're soft to the touch, more comfortable to wear and extremely absorbent. Each cloth diaper has two rows of snaps on the waist and are fully adjustable to fit most babies. LilBit cloth diapers fit most babies weighing from 6 to 33+ pounds. They are soft, easy to use, breathable, reusable, waterproof, machine washable and size adjustable to S ,M ,L.
Insert: Inserts are made of super absorbent bamboo charcoal. They're antibacterial, hypoallergenic, more absorbent than regular flannel and dry much faster. Size of insert: 14" x 5". Package included: 6 printed diaper covers + 12 bamboo charcoal inserts. LilBit Baby Cloth Diapers are awesome! I've used quite a few cloth diapers in all my years of cloth diapering and can honestly say these LilBit Baby Cloth Diapers have the best fit. They are completely adjustable and can fit an average newborn up to a child weighing 33 pounds. With most cloth diapers I've found at some point they leak around the legs because they just don't adjust enough. With LilBit Baby Cloth Diapers I did not have this problem and found them to fit perfectly around the thighs. LilBit Baby Cloth Diapers are super absorbent and baby seems to prefer them to disposable diapers. 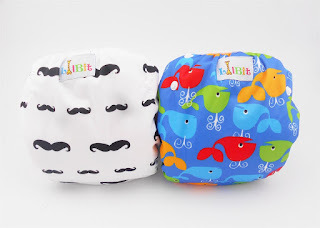 LilBit cloth diapers are also the most affordable cloth diapers I found thus far and will provide your baby with complete diaper coverage though out the diapering stage of life. I highly recommend LilBit Baby Cloth Diapers! Waterproof polyester PUL outer layer. Interior Polyester mesh for easy clean ups and a comfortable feel for baby's sensitive skin. Elastic at the waist and thigh openings with soft lycra bindings provides a secure, stretchy fit and easy on and off. Double-side (3x2) snap openings on the waist, 3x3 snaps in front of diaper to adjust the size. LilBit Baby 2 Pack Boys' Adjustable Baby Swim Pants are the perfect option for reusable swim wear for babies. I love that these are reusable and completely adjustable so baby can wear them from year to year. I also love the cute prints that LilBit Baby offers and that they're comfortable for baby to wear. I have tested these out in the pool and can say that they work very well and do not leak. I highly recommend LilBit Baby 2 Pack Boys or Girls Adjustable Baby Swim Pants! Wow these are so cute! I bet they save a lot of money in the long run. So cute. Mine are out of diapers but we are working on potty training. I absolutely LOVE these prints ... wish I had these when my kids were little. i'm passing this along to a friend that cloth diapers. looks awesome! These products are really looks amazing and while go through the reviews present here we are able to select the best one for our kids. most probably during the early age we parents are using diapers for our babies and it gives awesome results and helps to keep our baby's skin dry and hygienic. I loved reading this! This is the information I was looking for. Thank you so much.